Unlike whitewater kayaking, which appeals to more adventurous individuals, lake kayaking is a more relaxed experience available to everyone. Along Fontana Lake’s north shore, kayaking provides a unique view of the Great Smoky Mountains National Park where sightings of bear, river otter, deer or bald eagles are not uncommon. Interested? 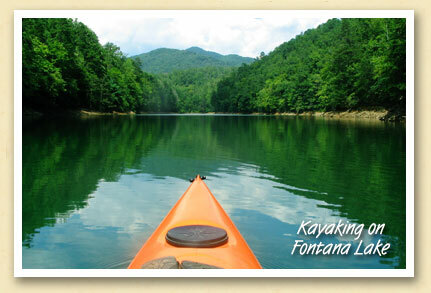 Visit the Bryson City website for information about kayaking in the Smokies, including outfitters. Innkeeper Scot Warf (Charleston Inn) took this photo as he glided into the cove below the Goldmine Loop trail near the eastern end of the lake.